Honest feedback based on deep experience. Maybe a licensing deal. "We make money with you, not from you." 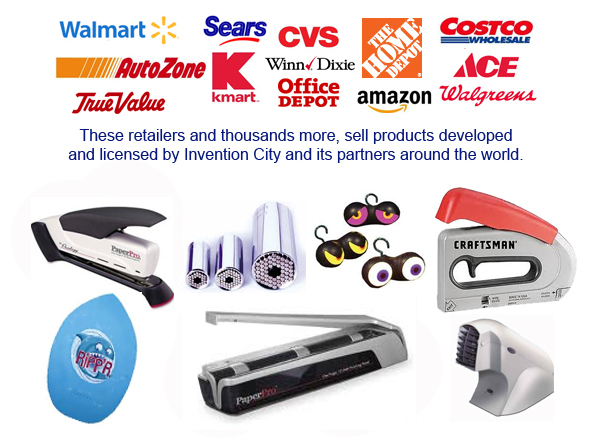 Products created and commercialized by Invention City and its partners have generated over $500,000,000 in retail sales and tens of millions in royalty income. We are actively looking to license new inventions in all categories and all stages of development. When we say "yes" we offer to do it all and pay for everything so that you risk nothing more - we take responsibility for patents, prototypes, engineering, design and marketing, to turn your new invention idea into a manufactured product with a real opportunity for market success. The first step to working with us is our Brutally Honest Review. Click to see the video and read our fine print in bold. Starting as garage inventors we've had over 25 years of experience creating, developing, licensing and selling inventions to Fortune 100 corporations and start-up companies. This gives us deep first hand knowledge of prior art research, market evaluation, building prototypes, engineering for manufacturing, industrial design, writing and filing US and international patents and trademarks, defending patents and trademarks in the US and internationally, negotiating licensing agreements, managing licensing relationships, sourcing and managing manufacturing and fulfillment, marketing via traditional distribution to mass merchants, chains, individual retailers, direct marketing via DRTV, internet and crowd funding, forming strategic partnerships and launching and selling start-up companies. We don't know of anyone in our industry who's had our breadth and depth of experience. We've enjoyed a lot of success and have learned from failures too. Learn more about us here. You can see some of our past and current product successes below. Click here to see some of the inventions we currently have in development. Over the years we've heard from inventors who've wasted thousands, tens of thousands and even hundreds of thousands of dollars pursuing their dreams and failing. Invention City's mission is to help inventors keep money in their pockets, increase their chances of success and commercialize great new product ideas through licensing and partnership deals. The Invention City team is comprised of successful inventors and entrepreneurs who've made their money by bringing new patented products to market. We want to make money with you, not from you. Read about us here . We believe that inventors should do as much as they can on their own and then, when informed and ready, seek help and advice from providers who genuinely care. Our Brutally Honest Review is a great way to get professional feedback and a real chance for success. A visit to the info booth is a good way to get started. Be careful about disclosing proprietary and confidential information to anyone. We hope that your visit is productive. Please visit us often and let us know how we can make things better. Should You Show Your Invention at a Trade Show?